Lovage (Levisticum officinale) is such a versatile herb and I am ashamed to say that it was overlooked in our kitchen until we moved to the farmhouse. It grows profusely in the potager and we also have another plant in a corner of the walled garden. So, I am fortunate to be able to gather plenty. Along with chervil it is definitely one of my favourite herbs. If you manage to get your hands on some, lay the celery like stems in the bottom of a tin before roasting a chicken. It also makes a great base for stews and then does a turn when the remnants of Sunday lunch are transferred into stock, simmering slowly overnight in the AGA to create a tasty rissotto or soup for weekday suppers. 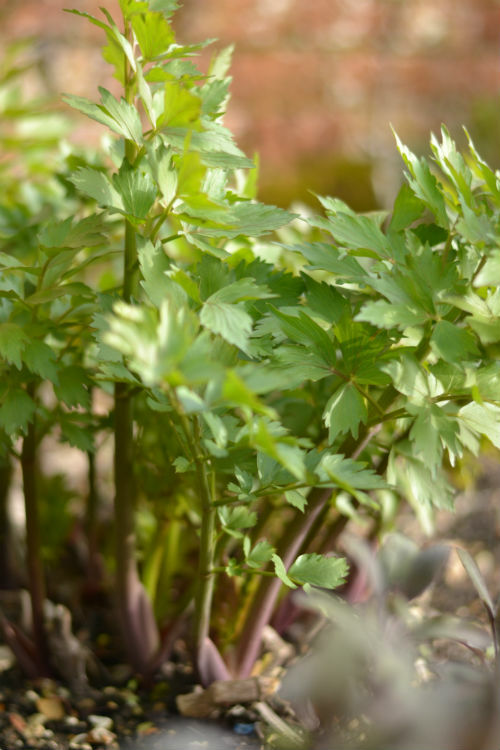 Lovage can be grown in a container, but to ensure that it remains healthy, you will need to use it regularly or to keep it under control, simply cut the long stems every week and then place in a jug instead of a bunch of flowers. Remember to change the water daily. Lovage will grow very tall, so if space is a premium,this may be something to consider. You need to make sure that you allow at least 1.5 m height during the summer months, so it could easily over-crowed a paved courtyard garden if not kept under control. Apparently the ancient Greeks chewed lovage to aid digestion but it was probably introduced to Europe by the Romans, who may have named it after the north-western coastal region of Italy, Liguria. If you decide to add a few stems to your favourite Italian dish, then remove the tough, outer layer as this can be bitter. Back in the herb garden, I am hoping to divide both established plants this week, along with the English Mace (Achillea ageratum). This should ensure a constant supply of both herbs later in the summer. 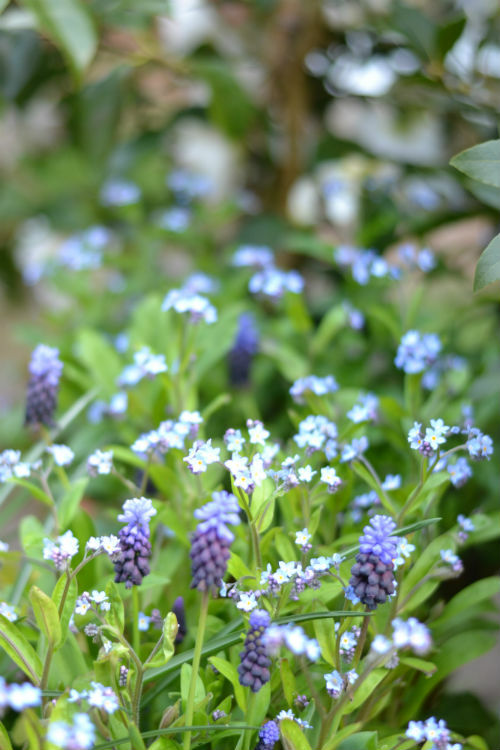 Elsewhere in our patch, the Forget-me-not’s have just begun to bloom. I absolutely adore the delicate profusion of dainty flowers. The plants have self-seeded in every ‘knook and cranny’ that they can find. A week or so ago, I also spent half an hour dividing a few of the most heavily populated areas in the borders (this was Monty Don’s idea, not mine and I am very grateful). The result was well worth the effort and I am amazed how quickly they re-established with a generous watering in, for good measure. The Muscari are just beginning to fade and make way for the bluebells. 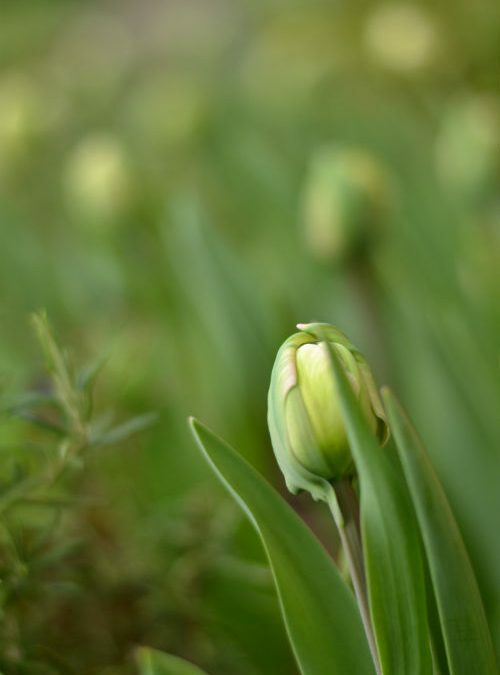 In the cutting garden, the tulips are just beginning to open. This variety is called ‘Finola’ and I didn’t plant the bulbs until late December, so I am amazed that they are already beginning to bloom. Later this week I am going to make a seasonal jelly to serve with lamb for Easter and finish potting up the dahlia tubers so that we have cut flowers for the farmhouse later in the summer.